HARTLEPOOL United have released Sidney Schmeltz and decided against extending the loan spells of Joe Ironside and Matteo Lanzoni as boss Ronnie Moore re-shapes his squad. As revealed by SportMail earlier this week Moore is looking to ship out up to five players and bring in a similar number when the January transfer window opens on Saturday. With new signings imminent, Moore has decided to release Dutch winger Schmeltz after his short-term deal at the club came to an end. Meanwhile, striker Ironside has returned to parent club Sheffield United after a one-month loan and Cambridge United defender Lanzoni has also been sent back to his parent club. All three players were brought to the club by former boss Paul Murray. Moore is hoping to have at least three new players in before the trip to Wycombe Wanderers on Saturday, with Sunderland defender Scott Harrison the first. Moore also held talks with an experienced League Two defender, available on a free, on Monday as he looks to bolster his defensive options. 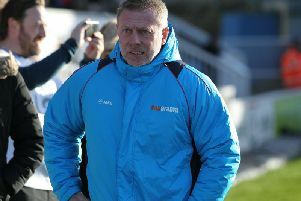 The Pools boss is also keen to add pace in the wide areas and bring strikers into the club, with the club eight points adrift at the bottom of Sky Bet League Two. Ironside made four appearances for Pools. The 21-year-old scored his first Football League goal with a cool finish from the edge of the penalty area to give Pools the lead against Oxford United recently before they came back to claim a point. He was partnered up front with Scott Fenwick in the 2-0 defeat to Morecambe on Sunday but Moore has decided against keeping the raw youngster on. Former Sampdoria youth Lanzoni joined the club last month but made only two appearances and has been an unused substitute in the last four games. The 26-year-old featured against Wycombe and Blyth Spartans in the FA Cup but didn’t impress. Schmeltz signed a short-term deal at The Vic at the end of October and went on to make seven appearances for the club, three of them from the subs bench. The 25-year-old winger impressed on his debut helping to inspire a comeback against Newport County but he has struggled to show that form since.